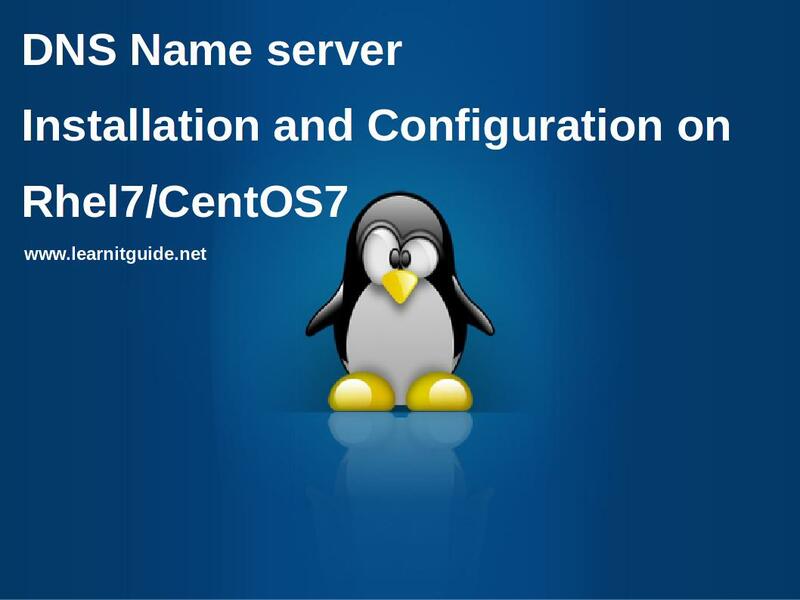 This article is a quick step by step procedure for installation and configuration of Linux DNS Name server using bind on RHEL7/CentOS7. Leave your comments if any and we appreciate your feedback. What is DNS (Domain Name System) and Why do we use it? DNS provides the resolution of hostnames to IP address and Vice versa. When some one tries to access any websites or any servername, example www.learnitguide.net, request will go to the particular server by resolving the name www.learnitguide.net to the particular server ipaddress 192.168.2.10 as configured in DNS name server. This is called Forward zone name resolution. Same can be done in reverse way as IP Address 192.168.2.10 will resolve to the server name www.learnitguide.net, this is called Reverse zone name resolution. Step 2: Edit the main configuration file. Open the /etc/named.conf and append the below configuration. This entries tells the DNS service which domains we are hosting here. The first zone statement for forward zone and the second zone statement for reverse zone. According to the file names, we have to create two zone files under /var/named/ which is given in detail in Step 3. Change the below values in the same configuration file /etc/named.conf and save the changes, else your client will not able to listen or query. Now have to set up the two zone files as declared in the main configuration file /etc/named.conf to where its pointing to. Go to the default zone files directory /var/named and create/copy the forward and reverse zone files. Change the ownership of the files as "root:named". Edit the learnitguide.net.forward file for forward zone and add the client servers name, here we add only one node linux2 for testing. Edit the learnitguide.net.forward file for forward zone and add the client servers ip address last digit number, here we add only one node "20" for testing. Step 5: Verification of the name server resolution. Use nslookup command to verify the resolution of each servers added in zone files. That's it for server end configuration. Lets do it on client end. Step 2: Verification of the name server resolution.